Having been working as a qualified midwife for almost 4 years, I decided that it was time for a new challenge! After a couple of days of researching, and a few phonecalls with Susie from Work the World office, I was all booked to spend a month in Dar es Salaam, Tanzania! I booked my trip 9 months in advance, so had lots of time to plan, and lots of time to get nervous! The team at Work the World were always at the end of the phone to answer questions and give advice in the lead up to the trip. The online MyTrip page was very very useful in ensuring we had everything sorted before we headed out to Africa. The information pack which is easy to download was a great guide for making sure we were organised! No amount of preparation however can prepare you for the culture shock of Africa! It is something that has to be experienced! However, on arrival to Dar es Salaam at 4am after a very long and nerve-racking journey from the UK, we were met at the airport by theProgramme Manager Mark - (AKA one of the nicest people in the world!). We were welcomed with a big smile and a taxi waiting for us, and made the journey to the house. We knew immediately that we were in good hands! Over the following 2 days, we had our orientation around Dar es Salaam which was fantastic. Mark and Alpha (the Programme Manager - AKA - one more of the nicest people in the world!) showed us around the city, showed us how to use public transport (travelling by Dalla Dalla and a Bajaj is an experience you won't forget! ), helped us change our currency, showed us where we could use WIFI, good local restaurants etc. We were also given lots of tips on personal safety in Tanzania which was very useful. The Work the World house is AMAZING! Big, cosy and clean! Big swimming pool, lots of deck chairs, porch with sofas which is the main socialising area, separate lounge with sofas. Plenty of places to relax! The rooms were always clean and tidy thanks to the lovely housekeeper Nema. Prepare for cold showers, as warm water is rare in Tanzania - you get used to it though! I was a bit worried about the food been a bit of a fussy eater, however it was gorgeous, and there was a lot of choice! Rahema's food is fantastic! You haven't lived until you have eaten her potato salad!! Thursday night is the famous house BBQ night. DJ Mark gets on the decks and you have a fab time around the pool with african dancing, limbo, and lots of great food. I always felt very safe at the house thanks to the fantastic 24 hour security team. The day time security guard Edito is an absolute legend, it's worth travelling to Dar es Salaam just to meet him! There are also twice weekly Swahili lessons at the house which were very useful, and the teacher is lovely. My placement was at Amana hospital in the Maternity Block. 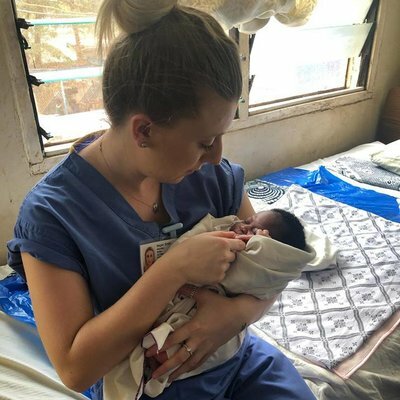 I felt quite confident going into the placement as qualified midwife, however I couldn't have prepared myself for the experiences that I had during my 4 weeks at the hospital. Midwifery care is so different in Tanzania. Amana hospital has approximately 80-100 babies born every day!! Both staff and resources are limited, and it really is all hands on deck! 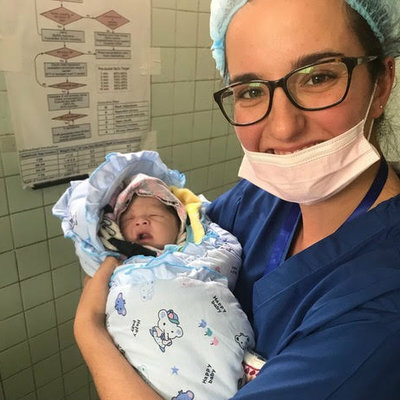 I managed to gain lots of hands on experience in delivering babies, resuscitating babies, C-sections, antenatal and postnatal ward care, and working in the Neonatal unit. I saw everything from twin deliveries, breech deliveries, severe pre-eclampsia, and pre-term births. Unfortunately, I was exposed to quite a lot of fetal loss, which is a daily event at Amana, and was a sad but expected part of the placement. Sister Grace is the midwife in charge, and she is very welcoming to overseas students. And she loves having her photograph taken so don't forget your camera! 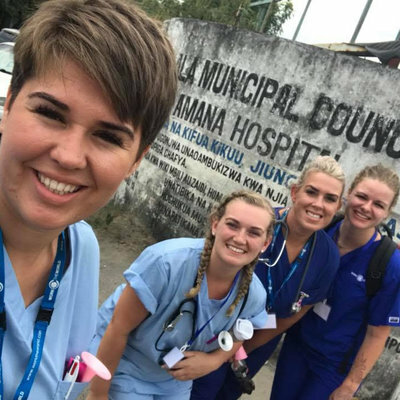 My placement at Amana hospital has not only benefited me as a Midwife, but I am proud to say I got the opportunity to work there. After the working day was done, there was plenty of time for fun and travelling. Every Wednesday night at Coco beach (2 minutes from the house) is Karaoke Night. A mixture of Mzungus (the African term for white people! ), and Tanzanian locals on the beach with a big Karaoke screen singing away into the early hours! Not to be missed! Q-Bar is another favourite with Work the World students, which is just over the road from the house. A massive trip highlight for me was the 3 day Safari to Mikumi National Park, which I booked with Work the World before I went to Tanzania*. Do not hesitate to book this, it was absolutely amazing! Camping in a National Park, dinner and drinks around a big camp fire, all your meals and proper tents provided, a fantastic safari guide and big safari jeep all to yourselves for 3 days while you drive past hundreds of giraffes, zebras, elephants and more in their natural habitat! Just brilliant! Being 1 metre from a Lion was a moment I will never forget, and I have the photograph to prove it! If you are going to Tanzania, you MUST go to Zanzibar! Only an hour away by ferry! The place is out of this world! Pure white sandy beaches, clear waters - paradise! It was so amazing, we decided to visit twice. Whether you want to simply lay on the beach all day (like me! ), or visit the more historical and cultural sights of Stone Town, there is something for everyones taste. We visited Prison Island to see the endangered turtles which was fab! There's a Spice Tour which was very popular, swimming with dolphins, snorkelling, and most importantly - partying! You HAVE to go to Bikini Bar Party on a Friday night in Zanzibar. This was one of the best nights of my life! Amazing remixes of English and African music, dance offs with African locals, Massai, and tourists! And head over to the Full Moon Party at Kendwa Rocks on a Saturday night. Both on the beach! Just amazing! We also had the chance to visit the orphanage in Dar es Salaam which was such a heart warming experience. We took them lots of little presents which they loved. Definitely something very worthwhile to do during your trip. I had my 25th birthday whilst in Tanzania and the day couldn't have been made any more special by my housemates and the Work the World team! I woke up to a room full of balloons, banners and cards. The whole house and the staff went out for a birthday meal, where Rahema had arranged a cake to be brought out to me with my name on. Followed by a night at the Karaoke. A birthday I will never forget! Anyone considering visiting Tanzania, do not hesitate! Africa is an amazing continent full of inspirational people who will touch your lives. I have gained invaluable experience in Midwifery, and made friends for life along the way! The best month of my life! *The Work the World safari is available exclusively to students on the programme. This can be booked directly from your MyTrip portal after your placement on the programme has been accepted.